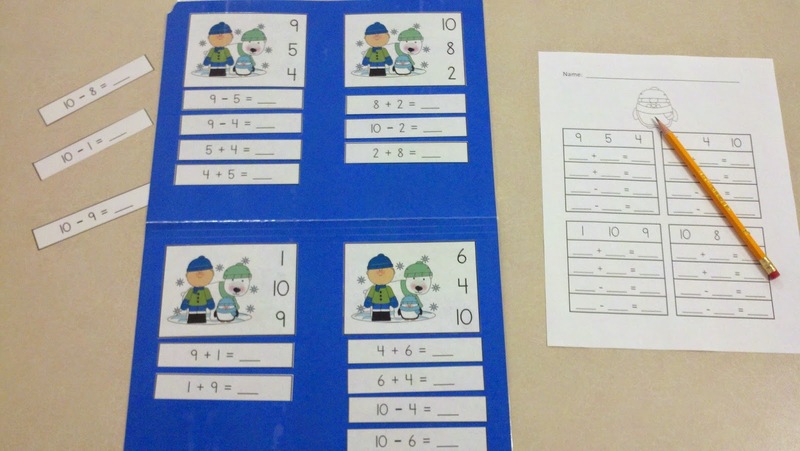 The fun winter themed matching activities may also be used as file folder games. The fact family matching activities have a card with graphics and the numerals for the fact family. The matching activities can be used as file folder games. Learners match the 2 addition equations and 2 subtraction equations to the fact family correct card. There is a choice of 3 formats for the equation cards. The first option has the complete equation. Ex: 1 + 2 = 3. The second option has the sum or difference missing. Ex: 1 + 2 = _____. (The photo above shows this option.) The third option has one addend or the subtrahend missing. Ex: 1 + _____ = 3. After completing the matching activity, students write the equations on the recording page. These varied formats on the equation cards will allow you to choose the format that best meets your learners’ needs. The choices will also give you options for differentiation. These math center activities work well in inclusion classrooms because of the differentiation options. This resource is very versatile. In addition to the differentiation options offered by the equation formats, you may use the recording pages (without the matching activity) as no-prep printable worksheets.